NOTE: There is no universal agreement about styles or dates. 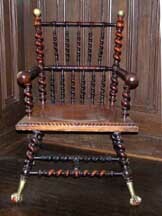 General term for English and American furniture, 1840-1900. "Victorian" refers to the reign of England's Queen Victoria, 1837-1901. More generally, it refers to the the second half of the nineteenth century. In the U.S., some historians use the term to describe the period after the Civil War until World war I in 1914.